Snorkeling and SCUBA diving are some of the most popular activities to enjoy in Mexico's beach destinations. Mexico's coastlines are teeming with colorful underwater life and no doubt you'll want to see it for yourself. SCUBA diving requires special training and complicated equipment, but just about anyone can snorkel without any particular preparation—if you choose an easy spot, you don't even really need to know how to swim. With its clear water and proximity to the Mesoamerican reef, Cozumel island offers excellent snorkeling. Just off the coast of the Riviera Maya, Cozumel is 30 miles long and about 10 miles wide and offers prime underwater viewing conditions, particularly at Punta Sur or Chankanaab Park. There are dive shops all over the island, so you'll have no problem getting equipment and assistance. If you didn't bring your own equipment, rent some snorkel gear and swim out from the shore, or if you want to really explore the reef, hire a guide to take you out on the water and show you the best spots. If you choose to snorkel along the shore, make sure the conditions are safe. Check the beach warning flag to make sure the currents aren't too strong for swimming and snorkeling. When looking for a spot to snorkel, keep an eye out for natural beaches. Lots of sand is great for lounging or building sand castles, but not your best bet if you’re looking for fish and other sea life. Beaches with rocks and seaweed are more likely to shelter off-shore reefs, caverns, and other protected areas where fish may seek shelter, giving you a lot more viewing opportunities. Akumal Bay is located on the Riviera Maya between Playa del Carmen and Tulum. This is a popular spot for snorkelers because there are green turtles—an endangered species of sea turtle—that come here to feed on the ample sea grass beds. There are many dive shops offering services along the beach. You can join a group and go out with a guide, or if you want a more private experience, just rent some gear and go out on your own. The best spot is to the left when facing the beach. The turtles are used to seeing swimmers here and aren't easily startled, so you can swim alongside them—an amazing experience! The government has set some limits to minimize the impact to the turtles, including restricting the hours of snorkeling from 9 a.m. to 5 p.m., and requesting that swimmers maintain a distance of a few meters from the turtles at all times. Don’t wear flippers for snorkeling with sea turtles because you could accidentally kick them, and in general, just be careful not to disturb them—they come here to feed and rest. Also, you may see stingrays, which can be awe-inspiring, but keep in mind that their sting can cause serious lesions. It's best to get to Akumal as early as possible for snorkeling as a lot of people do come to have this incredible experience of swimming with sea turtles. The geology of the Yucatan Peninsula is mainly limestone, making for flat, porous terrain. There are a great number of natural sinkholes, known as cenotes, which comes from the Mayan word for well. Cenotes offer a completely different experience for snorkelers because they're generally fresh water, so there's a whole array of aquatic life that you won't find in the ocean. Cenote Dos Ojos is one of the best cenotes for snorkeling. Dos Ojos means two eyes and the name refers to the fact that it is made up of two sinkholes that are connected by a long, narrow cavern that you can swim through when the water level is high enough. You can also swim to the “Bat Cave,” which is much darker and inhabited by a multitude of bats. 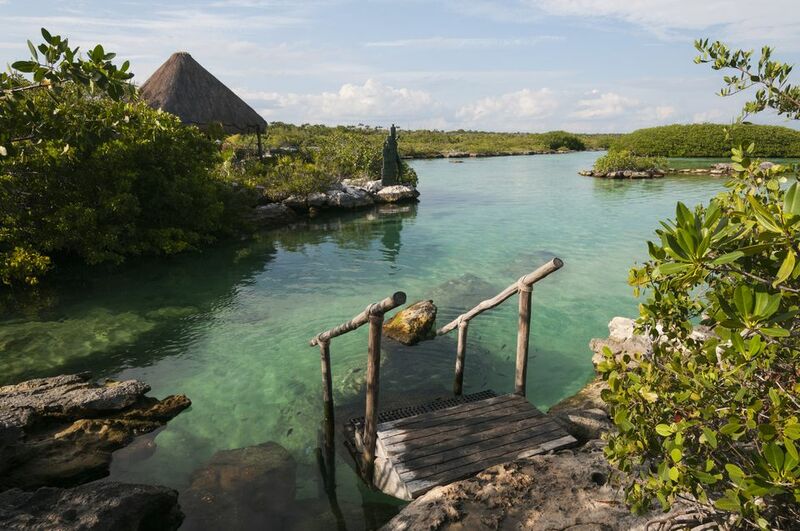 The water is crystal clear, and though you’ll see few fish, you’ll have lots of opportunities to see stalactites and stalagmites as well as wildlife including birds, bats, iguanas, and more. Cancun's underwater museum (offically Museo Subacuático de Arte, or MUSA for short) is an artificial reef with over 500 sculptures designed by various artists which were placed in the bottom of the ocean where coral and seaweed grow on them freely. The artificial reef helps promote the growth and formation of natural reefs and protects them from strong currents. Some people prefer to see these sculptures up close by diving around them, but you can also enjoy them from above while snorkeling. It's one of the coolest underwater museums in the world. The Sea of Cortez got the nickname "nature's aquarium" from the famous underwater explorer Jacques Cousteau. This body of water separates the Baja California Peninsula from mainland Mexico. It certainly is a beautiful body of water with lots of sea life to explore. One of the special experiences you can have here is swimming and snorkeling with sea lions. There are a few locations in the Sea of Cortez where you can enjoy this activity, including Cabo Pulmo (which you can visit as a day trip from Los Cabos), and Isla Espiritu Santo, which is close to La Paz, farther north along the peninsula. Huatulco is a destination on the Pacific coast in the state of Oaxaca. It is made up of a string of lovely bays, several of which are pristine and completely undeveloped, making for excellent snorkeling. The easiest spot to snorkel is La Entrega, where you can just swim along the rocky side of the bay to see lots of sea life. You can also take a boat excursion out and explore some of the virgin beaches that are surrounded by Huatulco National Park. One good option is Cacaluta Bay, which has a long expanse of beautiful pristine beach and is only accessible by boat.